Flea and tick season can be pure misery. Those nasty critters hide in the carpet, bedding, furniture - any place where Fido and Fluffy have free reign (and some where they don’t.) While there is no substitution for good overall pet hygiene, sometimes you just need a little extra help. Flea n’ Tick blend was designed to do just that. 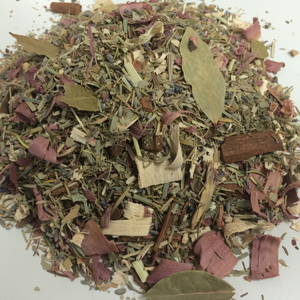 It is a proprietary mix of dried botanicals consisting of Bay Leaf, Thyme, Rosemary, Eucalyptus, Purple Echinacea Flower, Lemongrass, Cinnamon Chips and Cedarwood. Pleasant to us but not to fleas and ticks! They will avoid it like the plague (pun intended). Simply put the mixture in sachets or muslin bags and place them around the house – in corners, between pet bedding, around sliders and pet doors. The mixture may also be sprinkled directly around the perimeter on the outside of doors and entry ways. An effective boost to drive away those pests and save you and your pets from harsh chemical sprays and powders. Product Contains:Dried botanicals consisting of Bay Leaf, Thyme, Rosemary, Eucalyptus, Purple Echinacea Flower, Lemongrass, Cinnamon Chips and Cedarwood.